The best-selling author speaks on the future of grassroots progressive politics. Over the weekend, more than 4,000 people gathered for the People's Summit in Chicago. Among those who spoke was Vermont Senator Bernie Sanders, who called the Democratic Party's strategy an absolute failure and blamed the party for the election of President Trump. This comes after the Labour Party in Britain won a shocking number of new seats in the British election. Labour leader Jeremy Corbyn is now poised to possibly become the next British prime minister. 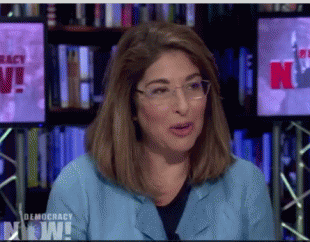 For more on these insurgent progressive politicians, we speak with best-selling author and journalist Naomi Klein, whose new book is "No Is Not Enough: Resisting Trump's Shock Politics and Winning the World We Need." AMY GOODMAN: This weekend, 4,000 people packed the McCormick Place convention center for a People's Summit. Independent senator, former presidential candidate Bernie Sanders delivered the keynote speech. During his speech, he repeatedly criticized the Democratic Party, calling it an "absolute failure" and blaming it for the election of President Trump. SEN. BERNIE SANDERS: I'm often asked by the media and others: How did it come about that Donald Trump, the most unpopular presidential candidate in the modern history of our country, won the election? And my answer is -- and my answer is that Trump didn't win the election; the Democratic Party lost the election. Let us -- let us be very, very clear: The current model -- the current model and the current strategy of the Democratic Party is an absolute failure. This is not -- this is not my opinion. This is the facts. You know, we focus a lot on the presidential election, but we also have to understand that Democrats have lost the U.S. House, the U.S. Senate. Republicans now control almost two-thirds of the governors' chairs throughout the country. And over the last nine years, Democrats have lost almost 1,000 legislative seats in states all across this country. Today -- today, in almost half of the states in America, Democratic Party has almost no political presence at all. Now, if that's not a failure, if that's not a failed model, I don't know what a failed model is. AMY GOODMAN: -- right now of the Senate. He is supposedly like the outreach person. He was brought into it. But he's got a fierce critique of the Democratic Party. NAOMI KLEIN: Yeah. And I think he's been biting his tongue a little bit. I might speculate that he was inspired by what just happened in the U.K. with Jeremy Corbyn -- we know he just came back from a trip to the U.K. -- because there is an interesting parallel, in the sense that Jeremy Corbyn was elected by a grassroots, insurgent, youth-led movement. He was elected as leader originally -- a youth-led movement called Momentum in the U.K., many, many young people who joined the Labour Party in order to support Jeremy Corbyn. And there was this -- they were treated as, you know, invade -- like, instead of being excited about this wave of interest in the political party, the Labour Party establishment, the so-called New Labour party establishment, because Labour was rebranded by Tony Blair in the late 1990s to be the New Labour party, which is kind of like a labor-scented party as opposed to a party of actually working people, really using the tools of marketing as opposed to having a party that knows what it stands for and who it stands for. And so, Jeremy Corbyn was elected, and there was just this campaign of sabotage. It was just the end of the world. He's unelectable. He was smeared. Then there was a coup to try to unseat him. He was sabotaged relentlessly by his MPs, while he was leader, who were constantly leaking damning information, trying to make him look bad in the press, sabotaging him at every front, right? But the insurgency was ultimately successful, in that this campaign was a tremendous upset. It was an -- sorry, this election was a tremendous upset in the U.K. [Theresa] May did not need to call the election. She said she wouldn't call the election. The only reason she called the election, because she was so convinced that she was going to get an overwhelming majority, which was supposed to give her this mandate to get the best deal possible under Brexit as they negotiated with the EU. And there's this huge upset, and, in fact, she loses all these seats, she loses her majority. Jeremy Corbyn wins about 30 seats.